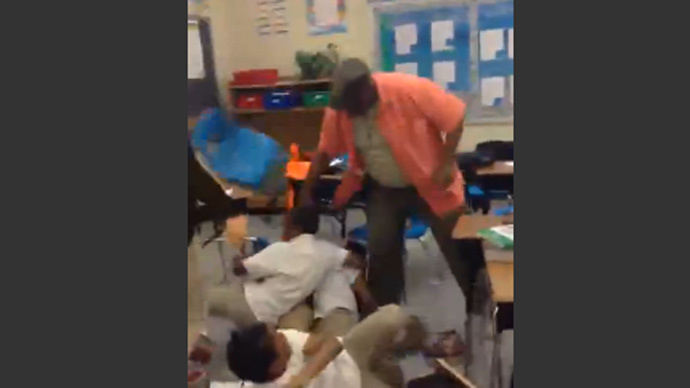 A Maryland substitute teacher has been sacked after a video emerged of him hitting middle school students with a belt. The students' parents are extremely angry – but others online say the teacher did the right thing. The video, posted on LiveLeak, took place at Gwynn Park Middle School in Brandywine, Maryland on Friday. The footage first shows students fighting or roughhousing on the floor. The teacher is then seen hitting those involved with his belt. Screams can be heard throughout the classroom, and one girl gives a terrified glance into the lens of the device recording the chaos. Some laughter can also be heard. The teacher can be heard saying “Clean this room up,” before the video is turned off. Prince George's County Public Schools issued a statement Monday. “On Friday, May 15, a substitute teacher used improper actions to discipline students while in one of our classes at Gwynn Park Middle School. The substitute teacher has been removed from the classroom and the matter has been referred to the appropriate law enforcement agencies,” the statement reads. Parents are predictably angry at the teacher's actions. "What the teacher did went over the line with what he was paid to do," one parent said, as quoted by local news channel WUSA9. That sentiment was echoed by a grandmother waiting for a student at the school. "That was out of order for sure...it's awful,” she said. People across the country took to Twitter to express that the teacher has problems that need to be addressed. A teacher pulling out a belt and whipping peoples' kids is a sign of someone who has lost control. You need to get help. Some said he needed to be punished with jail time. But others saw no problem with the substitute teacher's actions. "He didn't do anything other than discipline some knuckleheads," one Facebook user wrote on the local news site's page. "This needs to happen more at home." It is not yet known whether the teacher, who has not been identified, will face charges.